“And don’t say anything you don’t mean. … You only make things worse when you lay down a smoke screen of pious talk, saying, ‘I’ll pray for you,’ and never doing it, or saying, ‘God be with you,’ and not meaning it. May 7, 2009: Would the Real Katie Ferguson Please Stand Up? January 4, 2010: The Truth Revealed! Before I get to the latest Other Katies, I’d like to point out the SSA’s really interesting Baby Name Popularity website, which gives all manner of data on baby names. As a result, I now know that in 1984, my birth year, the name Katie was 44th in popularity; Kathleen (my full name) was 71st; Kaitlyn was 90th, with other spelling variations falling lower, but still frequent; Katherine was 90th anc Catherine was 69th. All this results in lots and lots of women in their late 20s walking around with the name Katie, or something similar. 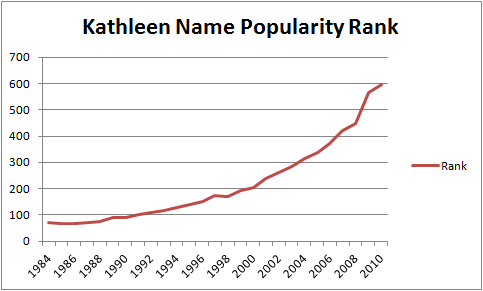 For you graphical types, here’s a chart of the popularity of the name Kathleen since I was born. Low numbers = more popular. The good news is that now, if I had a girl and named her Kathleen (aside from the confusion of my daughter and me having the same name), she wouldn’t have a zillion other Katies in her classes. I remember one time I was at camp and shared a cabin with like 5 or 6 other Katies. It was terrible. I quickly stopped responding to my name. Another time, I called and made a dentist appointment. When I walked in, the receptionist was astonished to see me: She expected their patient Katie Ferguson, the 3-year-old. So, latest in the Other Katie experiences: Google Plus mistaken identity shenanigans. Within the last week, I’ve had probably 15 people find and follow me on Google Plus — all perfect strangers. Since I’m not inherently interesting, I have to assume they think they’re following some Other Katie. Presumably they’ll stop following me when they realize I’m me. From the Other Katie mailbox, I have 12 emails of baby pictures from somebody’s iPhone, plus another four miscellaneous emails from that same person; one Recipe.com referral; and two emails from Ann, who hasn’t yet figured out that I’m not the right Katie. Loved your cute invite…I won’t be able to come as you know but do need your mailing address so I can send you invite for the 29th..hope that it works out and you can come..would still love for you to join us whenever that weekend..dinner or just hanging out.. I almost replied to this with some snarky response, but Ian wisely counseled against it. The next Ann email was shorter and less easy tempting on the facetious-response front. Found matt’s baby pictures..will send on day after tommorrow as owen going top get duplicated..my sister has some and others will mail on to you..hopefully! My only question is why on earth they apparently have chosen to use film for their baby pictures. How quaint. In fact, babies seem to be a theme from this spate of Other Katie emails. I got another totally separate email from Jill with a PDF attachment called “Hi I’m Ryder,” and it was yet another doggone baby picture/announcement (those parents had terrible taste in names, since their son will now spend his life mistaken for a moving company). Another email with a PDF attachment was a Citation Report from Dartmouth College for a Katherine E. Ferguson ’10, whose work in Environmental Studies 7 earned her professor’s accolades. I always was a good student — glad to see Other Katie is keeping it up. And, just to spice things up, I learned that I have a 2006 VW GTI. We have completed the service(s) scheduled for your 2006 VOLKSWAGEN GTI. Thanks for using our online scheduling solution! Note: This is an automated message and please do not reply to it. I didn’t reply to the email, but that one I actually called the number because I wanted to be sure the Other Katie got her car back. The people at the dealership were confused by my call but promised to take my email out of their database. They failed, though, because moments after my call, I got an email survey from them asking about my service experience. I seriously wonder sometimes what I could get away with, though. Could I have picked up the car, somehow…? To find your love language, just google it! I have attached the final interview questions with revisions as suggested by Prof. Wages. They are easy to attach or copy/paste to an e-mail if you want to e-mail participants. Unless I hear back from Prof. Wages, you should be able to begin interviewing. Please have all interviews done by March 28 and that should give us a least 3 to 4 weeks to process the information, etc. There are just so darn many Katie Ferguson emails from the last 6 months or so. Since I started keeping Other Katie emails in November 2008, I’ve received 155 emails intended for somebody else. It’s crazy. I’ve been considering starting a separate blog, or perhaps making a space on this blog, entirely devoted to Other Katie encounters. What do you think?